I'm not as high on Elmore Leonard as some crime fiction readers are, and my misgivings about George V. Higgins' The Friends of Eddie Coyle verge on heresy, according to at least one highly partisan commenter on this blog.Yet some of my favorite crime novels of recent years—by John McFetridge, Declan Burke, Charlie Stella, Garbhan Downey—are of the Higgins/Leonard school, with its humor; its ensemble casts and multiple points of view; its wry views of men and women at work; and equal measures of sympathy, understanding, and careful observation granted to cops and criminals alike. 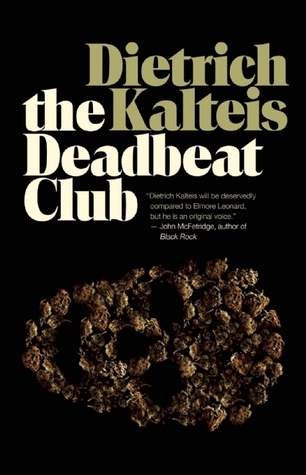 The latest entry is Dietrich Kalteis' second novel, The Deadbeat Club, about the complications unleashed by a drug war in southern British Columbia, a war with at least five sides and ensuing complications of which Kalteis good narrative advantage. Throw in fast action, an interesting observation about Canada and the United States as settings for crime*, and a use of cheese that you've likely never seen before in a crime novel, and you've got a few hours of heartwarming and violent fun on the way. * "His baby face defied his age, hair as wild as Tanner himself. Plenty of practice with Russian AKs, Tanner did a stint in the ashes of the former Yugoslavia. Left a body count up and down the Congo, hunted Al Qaeda and Islamics, popped off insurgents in Iraq, Darfur, more in the Gaza and Georgia. Now there was talk of North Korea. All the same to Tanner. A resume that had the military contractors drooling. "North of the border things were different, no military contractors up here. Tanner lying low and getting high, starting to feel bored. So when he heard Travis wanted guns, sending his boys to the shipyard, he offered to throw in, not worried what the gig paid."